Gun reform activists are calling for an all out ban of assult weapons while some gun owners contest that they have the right to own one. How many lives is an AR-15 worth? One? Two? 17? The answer is zero. Yet in 2018 in one of the more progressive societies in the world, this number is still up for debate. Owning a gun is nowhere near as important as protecting citizens, especially children, from gun violence. Automatic and semi-automatic rifles have no place in a private citizen’s hands and should be banned. An AR-15, the weapon of choice for Parkland HS gunman Nikolas Cruz, is a semi-automatic rifle which means that each time a shooter pulls the trigger a shot is fired without having to reload. Bump stocks can be bought and attached to semi-automatic rifles so that they operate as fully automatic rifles. When the trigger of an automatic rifle is held down, a continuous spray of bullets is released as seen in the Las Vegas concert shooting. In 1996 after a shooting in Tasmania that resulted in 35 deaths, Australia passed the National Firearms Act, banning all semi-automatic rifles and shotguns. The act required those attempting to buy a gun to undergo a strict background check, wait 28 days and provide a “justifiable reason” for owning a gun. Since the passage of the act, there have been zero mass shootings in Australia. Legislation such as Australia’s would not be as effective in America. For the U.S. to address mass shootings like Australia has, it would need to stop treating mental healthcare as a privilege rather than a right. Throughout this debate, many have said that the issue is not with guns, it is with mental health, when in fact, there is an issue with both. Under the current healthcare system, mental healthcare is expensive and difficult to access. Reforming mental health so that it is more easily accessible would mean that those who are mentally ill and pose a threat to society can be treated and prevented from accessing weapons. However, there will always be those who slip through the cracks, like Cruz and there should be safety nets to ensure that there is no way they can access automatic and semi-automatic weapons. The first important step is making background checks stricter. Ninety-four percent of American adults support stricter background checks, according to an October 2017 poll conducted by Quinnipiac University. Currently, when purchasing a gun in a licensed gun store, the buyer must undergo an instant background check. The information of the buyer is checked via the National Instant Criminal Background Check System (NICS) by the FBI. People who have been barred from buying a gun such as the dangerously mentally ill and felons will appear in the system. However, the system is often not updated, allowing those who have not yet been entered in the system to purchase a gun. In addition, guns sold at gun shows, online and by unlicensed private collectors do not require background checks. The system must be updated as frequently as possible and background checks must be required for all gun sales. While Congress debates these updates to the NICS system, citizens and students should demand that mandatory waiting periods and gun safety classes be added to any legislation. Florida has recently passed a new age restriction law, and while many states have started moving toward this, the country needs sweeping national legislation.The legal age to purchase a gun must be raised to 25. Federal law permits 18-year-olds to purchase rifles and 21-year-olds to purchase handguns. However, an unlicensed dealer may sell handguns to an 18-year-old. According to a November 2011 report by the Department of Justice, almost 50 percent of gun violence is perpetrated by those under 25. Until around the mid-20s the human brain is still developing with the prefrontal cortexa? ?the part of the brain responsible for reasoninga? ?maturing last. 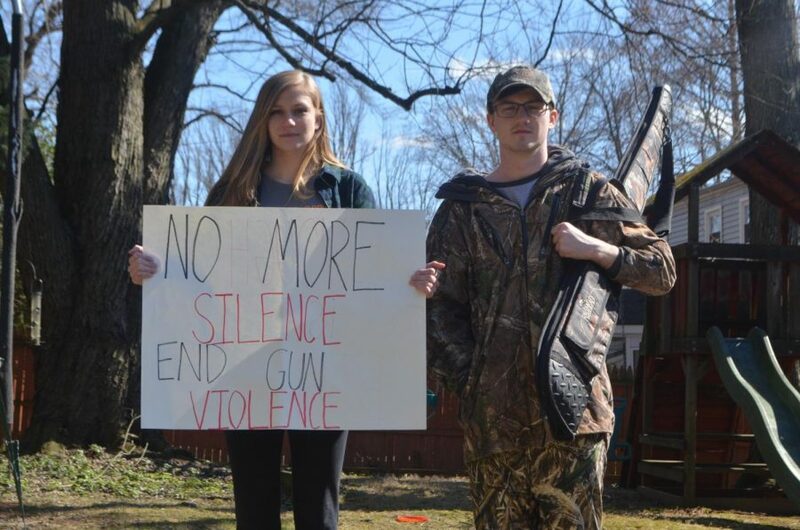 Students can no longer stand idly by while children are killed in school. The government owes it to the thousands of victims of gun violence to create new policies which will reduce rather than increase the number of guns in civilian hands. Following the Marjory Stoneman Douglas HS shooting, the gun control debate is once again dominating the nation’s discourse immediately following the tragedy, but this time it has remained in the headlines. The MSDHS shooting was a heartbreaking tragedy that calls for immediate action to combat gun violence that is plaguing society. However, banning assault weapons, such as the AR-15, is not the solution. The Colt AR-15 that the alleged shooter Nicolas Cruz used, is a semi-automatic military style assault rifle. It is also the most popular type of assault rifle in the U.S. While it is difficult to pinpoint the exact number of owned AR-15s in the country, the National Shooting Sports Foundation estimates between five and 10 million AR-15s are owned in the U.S. The weapon is popular among small game hunters for its versatility and accuracy. While the current background check system can always be improved, anyone who passes the extensive check is deemed capable of handling a firearm and there is no reason to stop them from obtaining a weapon. Such an act would be a clear infringement on their second amendment rights. Most of the focus in the recent gun control debate has been on the weapon itself. The real problem is how to keep weapons out of the hands of people who are dangerous to themselves and others. The Parkland shooter exhibited several warning signs. As an orphan who lost both his step parents, Cruz lacked a consistent support system. He also suffered from depression, was expelled for bringing a knife to school and had an abusive and violent history. All of the various adults and agencies who flagged Cruz’s behavior need to act on that knowledge so people like him never have access to a weapon of any kind. Another issue with a narrow focus on a weapon’s ban is that like anything else, if the AR-15 is banned from the regulated market it will emerge on the black market. This is what fueled the illegal alcohol trade during prohibition and the current illegal drug trade. The effects of illegal gun trade are already evident in cities like Chicago, which has some of the stiffest gun regulations in the country and one of nation’s highest gun homicide rates. The death toll as a result of gun violence was around 25 per 100,000 residents in 2016. If regulation is increased to the extreme degree of banning firearms, this market will grow and more weapons will be in the hands of criminals. There is no perfect system in place in any state in the U.S. for gun control. However, a combination of various policies can create a positive compromise. For example in New York the AR-15 is legal, while attachments and variations to the weapon such as adjusted stocks, muzzles and pistol handles are prohibited. New York has the fourth lowest gun death rate per 100,000. In Hawaii, a 21-year-old gun owner must acquire a permit from the county, go through a criminal background check and a mental screening that includes drug or alcohol addiction and psychiatric diagnosis. Hawaii’s firearm death rate is three times lower than the national average (3.6 to 11.1 according to the CDC). Banning the AR-15 is like putting a band-aid on a broken arm. The problem with gun violence goes beyond the weapons themselves. To stop gun violence the country needs to invest more money in mental health screenings and continue the discussion that started at MSDHS and translate it into lasting legislative action.